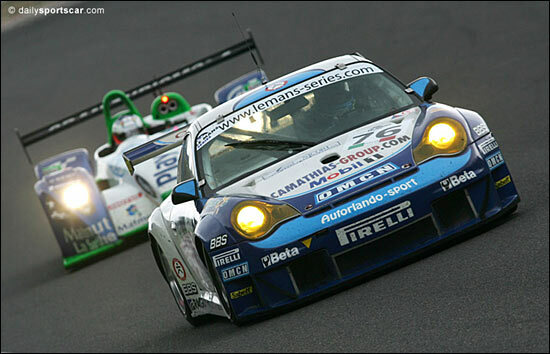 www.endurance-info.com is quick out of the blocks with this news item – which is that the 2006 Le Mans Series GT2 Champion team has ordered two Porsche 997 GT3-RSRs for 2007. The Le Mans Series win this year (Joel Camathias / Marc Lieb) has ensured one guaranteed entry for the Le Mans 24 Hours for the Italian team, which will be submitting an application for its second car too. The Le Mans Series, with its limited schedule of five races, means that Autorlando has space in its schedule again to enter the International Open Series, in which its 996 GT3-RSR Porsche had a tough time against all the new Ferraris this year, although Johnny Mowlem led the charge against the 430s. GT2 is going to see some furious racing in 2007, with Ferrari and Porsche going head to head, and challenged again by Panoz and Spyker. Here's the #76 Autorlando Porsche on the way to the class win at Spa this year.